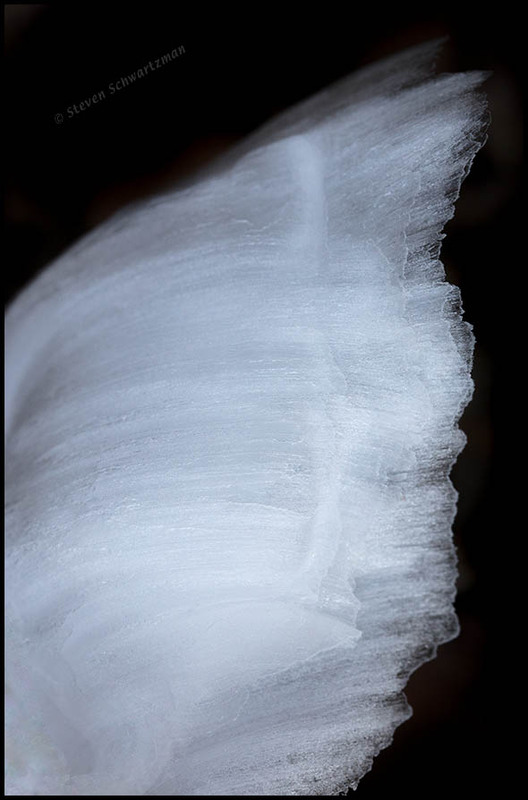 Yesterday you saw the sideways way the surface of the water pulls and folds and stretches on the rare occasions when it freezes in our creeks. 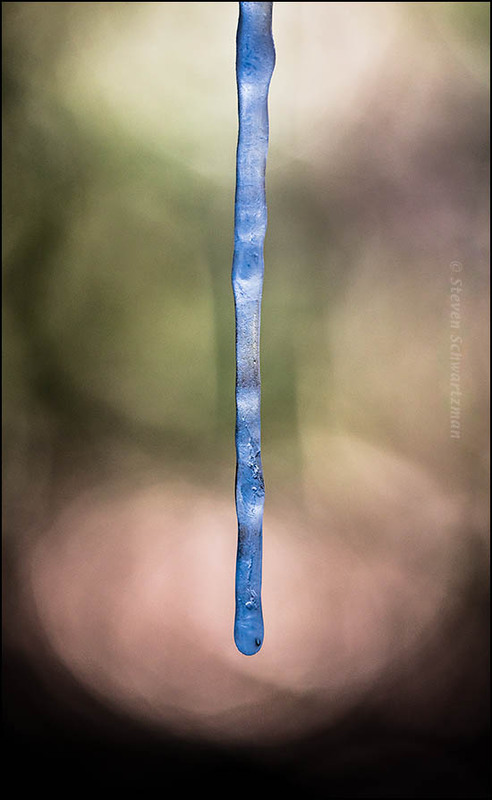 Another sort of freezing that we rarely see in Austin is the kind that turns the dripping-dropping movement of cold water into textured downward columns made of ice. Sustained temperatures in the 20s from the night of January 15th through the morning of the 17th did the trick. 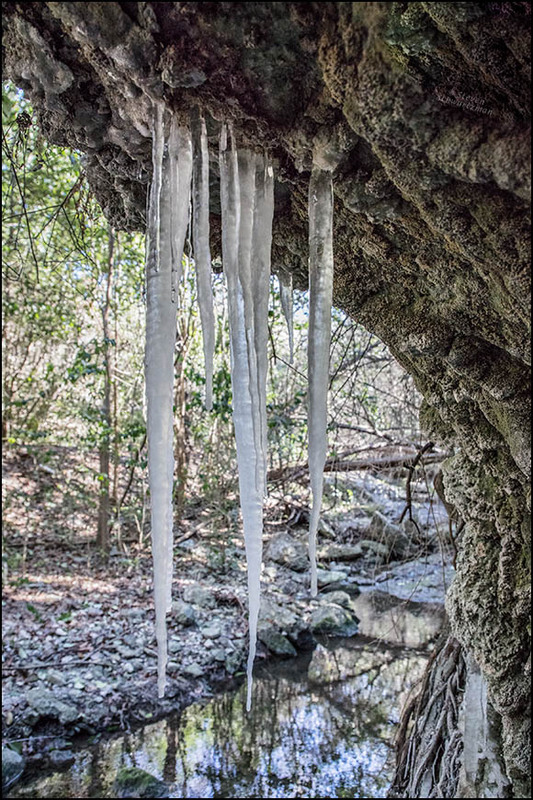 Both of today’s photographs show you icicles that had freeze-dripped down from the roof of the picturesque limestone overhang in the southern part of Great Hills Park. The first picture, taken with a wide-angle lens at an aperture of f/7.1, gives you an overview (nay, underview) of part of the limestone and adjacent woods. Call the picture pretty in a conventional way. 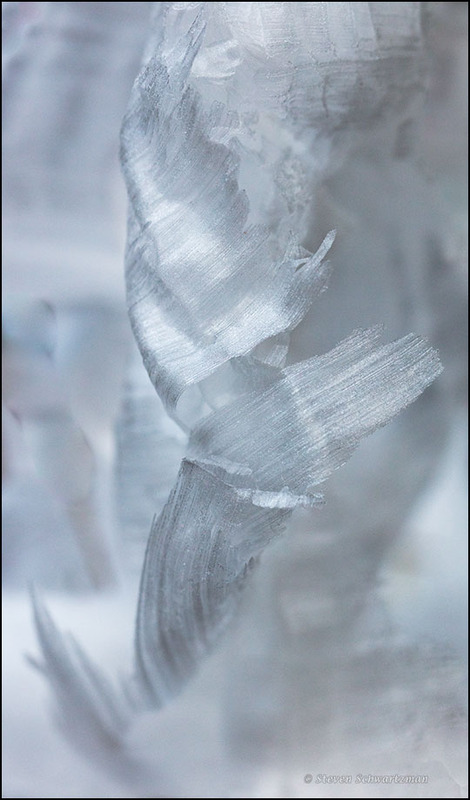 In the service of a different vision, from about the same place and aiming in about the same direction I focused on one icicle with a 100mm macro lens set at its broadest aperture of f/2.8 to produce the second photograph. The sunny light in the distance apparently influenced the camera’s sensor to register the ice as bluer than people’s eyes see it under the same conditions. The image as a whole may seem abstract and even unrealistic, but there are times when reality is overrated; this could be one of those times. 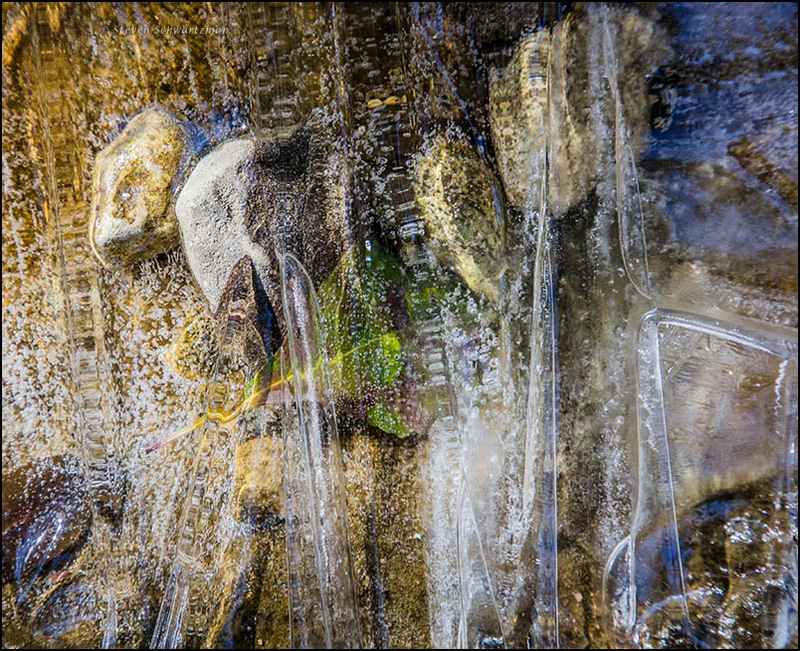 Both of the pictures included here from that day look straight down at places where the surface of the creek was turning to ice. The abstractness of the first image appeals to me. 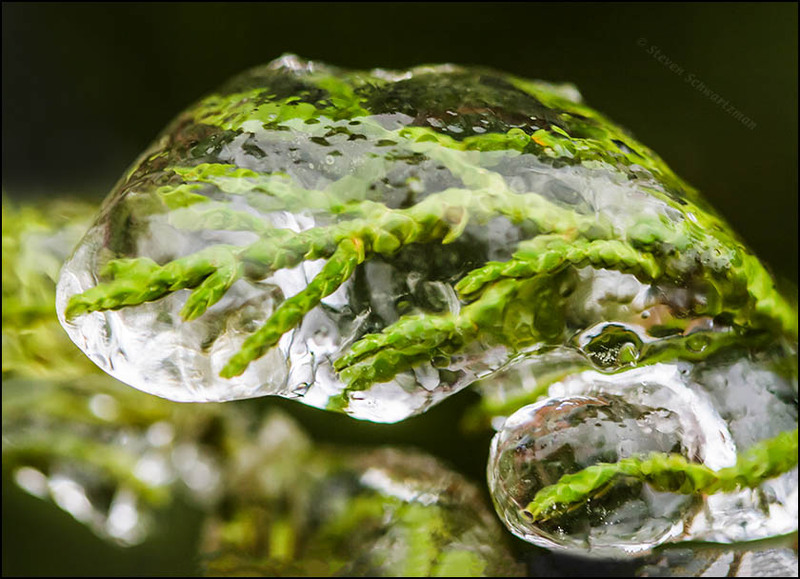 In the second photograph, notice the amphibian in the water beneath the ice. 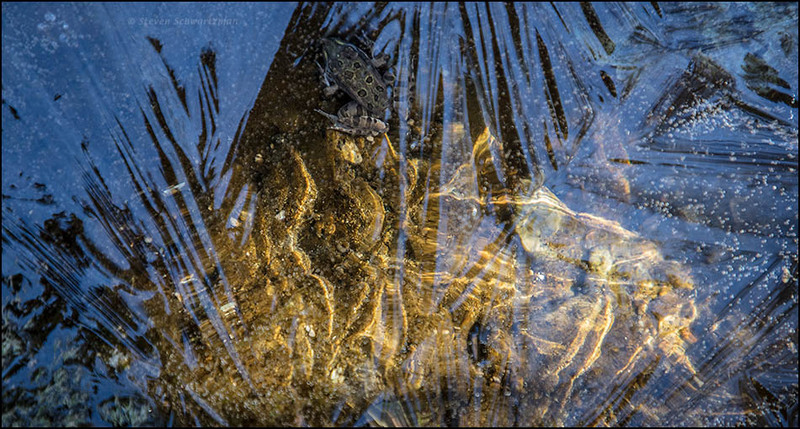 I was so intent on capturing patterns in the congealing surface of the creek that I didn’t see the animal till I looked at my pictures on the computer screen later, and even then it took me a while. * I find the line has several virtues. The thought is poetic. The meter is iambic pentameter. As far as Google can tell, no one has ever written down that sequence of words. Thanks, mind, for the inspiration. 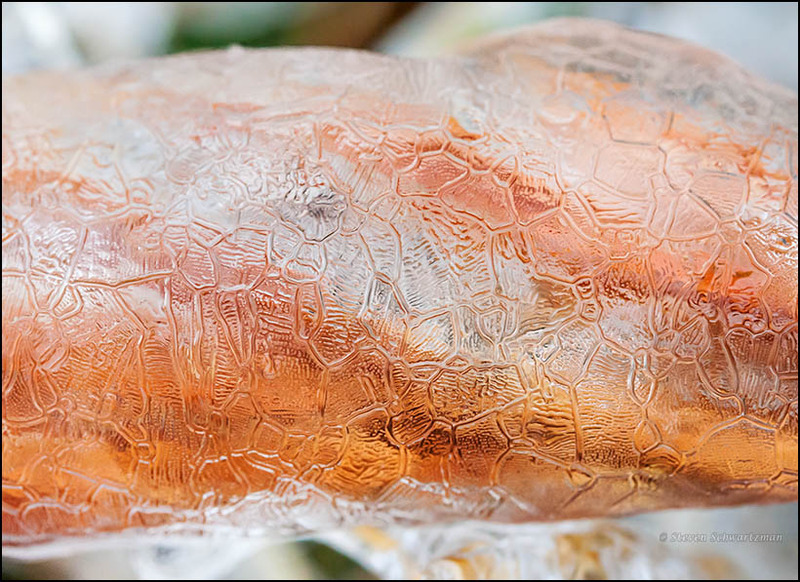 As you heard and saw last time, on January 17, 2007, Austin had an ice storm. The next morning, 11 years ago today, the land remained frozen. The roads were a little better, so I ventured beyond my neighborhood and ended up at a property on the northeast corner of Burnet Rd. and Wells Branch Parkway. 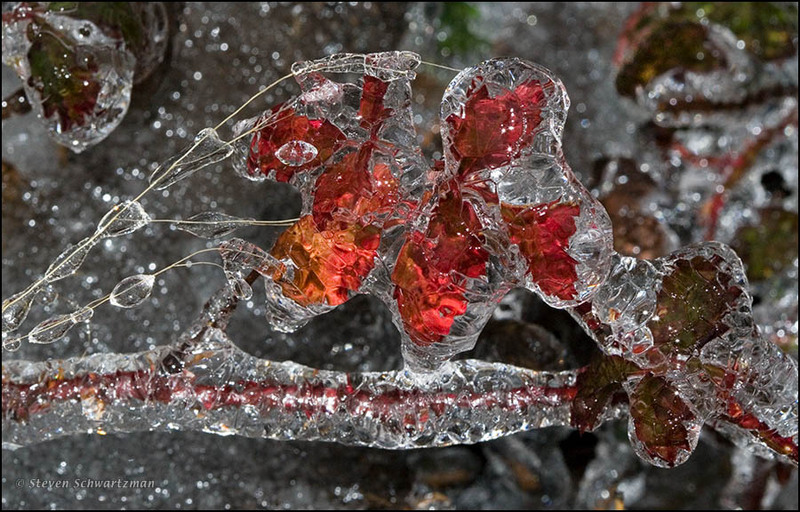 * There I spent some three hours suffering in the cold for the rare chance in such a warm climate as ours to record plants transformed by ice. The photograph above shows a southern dewberry, Rubus trivialis. 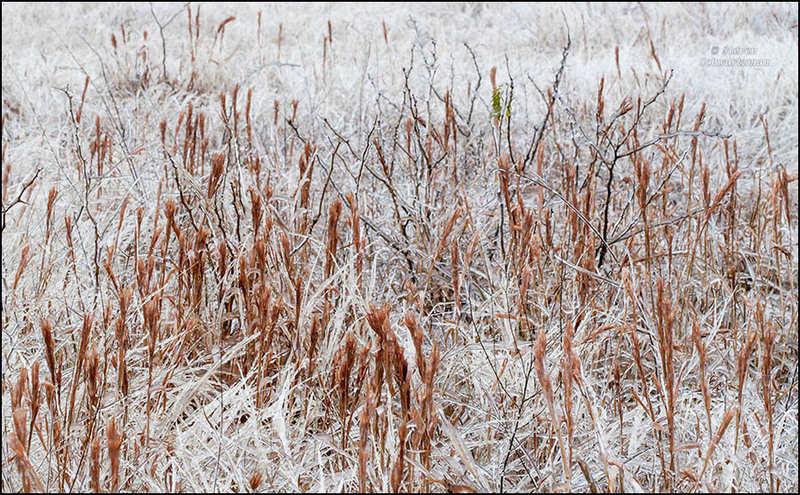 Below is a colony of bushy bluestem, Andropogon glomeratus. * That property, where I went photographing in the years before and after the ice storm, finally got built on, I think in 2015. I’ll always see it wild, as it was when I roamed there. 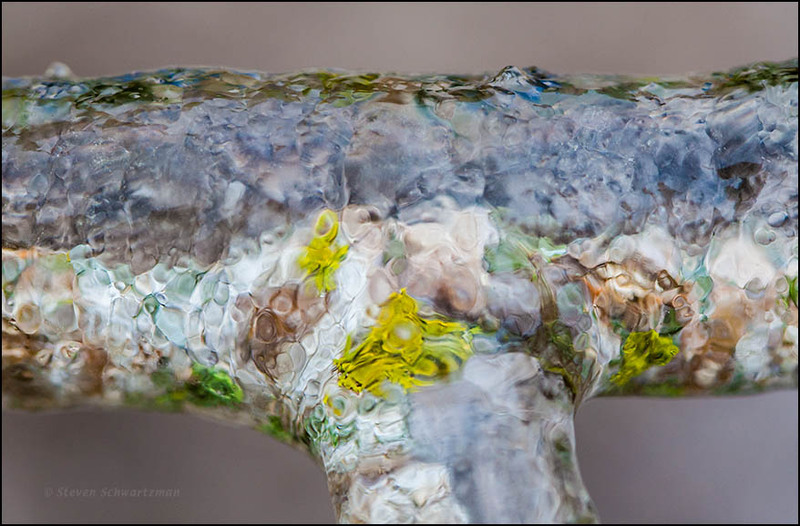 Given the persistent overcast here recently, I’d been waiting for a sunny day to go out and exploit the photographic possibilities of a possumhaw tree. Yesterday morning my chance came and I took it. 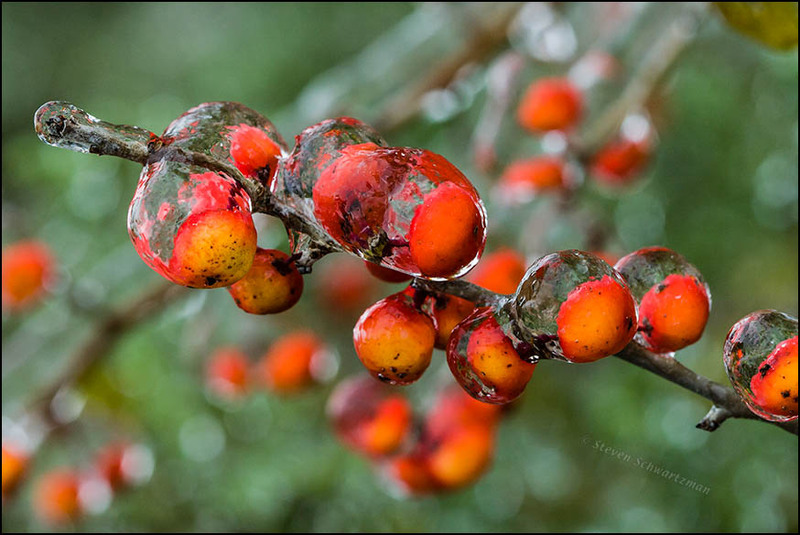 The scientific name Ilex decidua tells you that this holly is deciduous. That loss of leaves in winter makes it easy to see the clusters of fruit on the female trees and also easy for those red-orange fruits to contrast with the bright blue of the clear sky beyond them. 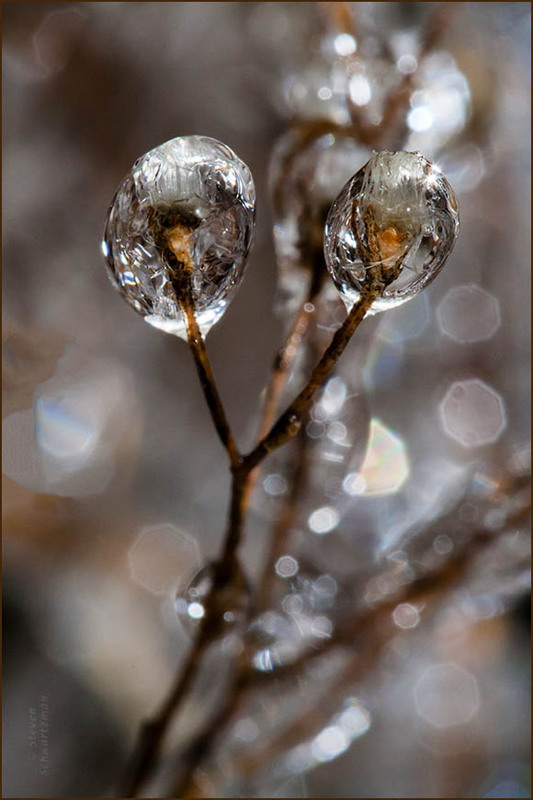 I don’t know if Carl Sandburg knew about frostweed’s magic ice trick, but those of you who’ve been coming here for a while sure do. 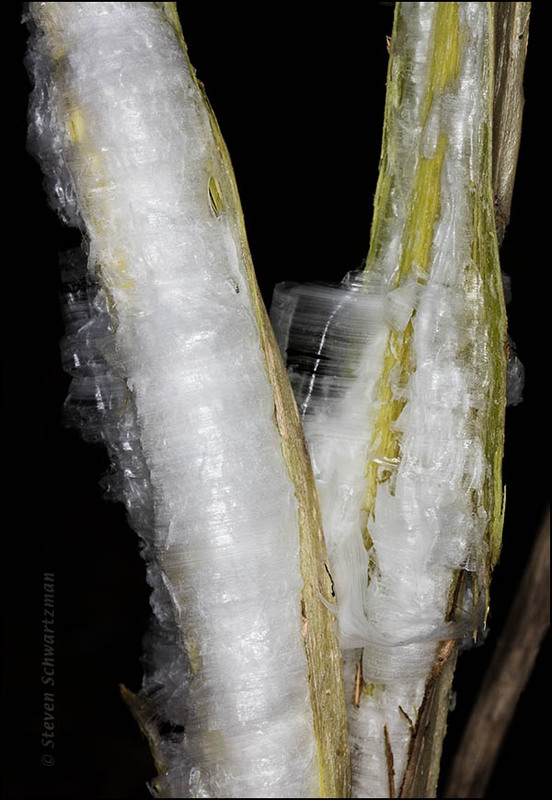 When the Austin temperature dropped to 26°F (–3°C) on New Year’s Eve, I knew there was a strong likelihood for frostweed ice on January 1st. When morning came, I dressed warmly and headed for a stand of Verbesina virginica I know in Great Hills Park, there to spend two hours in the cold taking scads of pictures. 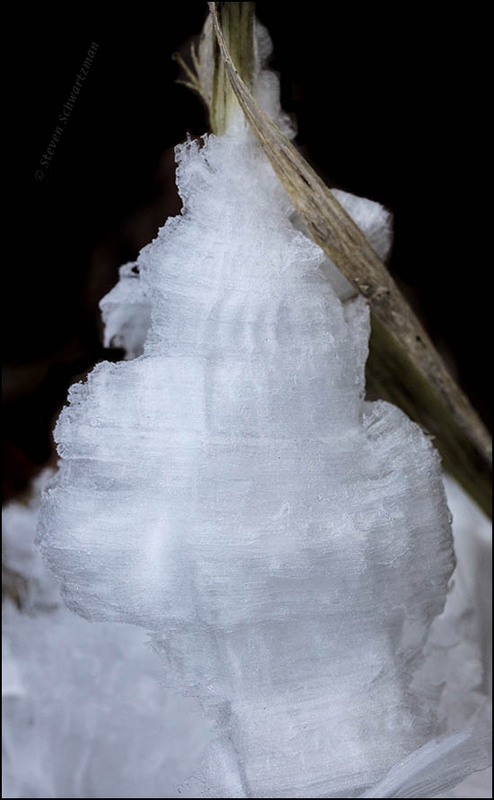 If you’re not familiar with the frostweed ice phenomenon, you can read more about it in an early post.